Though it has now become easy to capture any moment in our digital cameras but we need to compile and edit all our media files to access and view it. 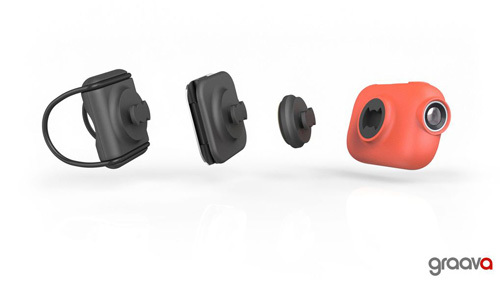 Graava Action Camera eliminates the extra process of compiling and editing the videos and images and comes with the editing function, which the camera performs itself. Graava is designed to capture HD videos in two qualities; 1080p with rate of 30 frames per second and 720p with 60 frames per second. It also captures still images of 8MP with 130 degrees of viewing angle. It is a modest camera, which can’t able to shoot neither extremely slow motion nor any 4K videos. However, it is built with “Hyperlapse” function, which compiles the still 8MP images in the camera to a 4K times lapse video. After knowing the unique features of this amazing action camera if you are trying to experience it then you have a chance to reserve it and save $150 by pre-ordering it from the Graava website, as the camera will be available at retail price of $399 in the early next year.